Waking up around 6.30 am to constant rain wasn’t a great start to the day. Both Ben and myself relocated to to dining room for breakfast. It was important today to complete our 4 hour hike by 12.00 in order to catch a boat back off the island. Today was the last day the seven of us were together, after the boat ride David, Karen, Nina and Christopher, with guide Lynn headed back to El Calafate in Argentina for their respective return home or next legs. But first our last hike to see Grey’s Glacier. In steady rain we took off with some reservations. The hiking path at most points was overrun with water streaming everywhere. We sent most of the day trying to finding ways of such obstacles. My hiking sticks proved invaluable today in the mud, rain and snow. Both David and Karen fell, a fate I would have experienced as well if not for the sticks. Legs sore, boots covered in mud and with little visibility I wondered what the point of today’s trek would be. 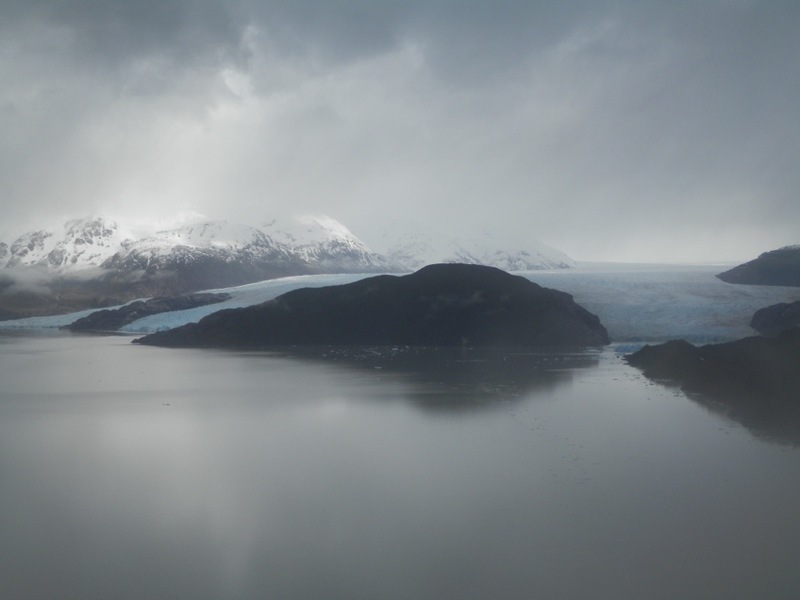 However by magic at the viewing point for the glacier the rain started date clouds receded and we got a great view of the glacier. With yesterday’s lucky view of the avalanche we were having a great deal of luck being in the right place at the right time. We returned in time for the boat ack and I collect email addresses and promised toward them and my photos with the group. My legs were very happy that 7 days of hiking had cone to a close and I made it with falling down in the slippery conditions or suffering any injuries. A sad farewell and Alvaro, Kurt, Ben and myself returned to Puerto Natales which took about 2 hours but seemed longer in very wet clothes. Kurt scored the single room on this occasion.